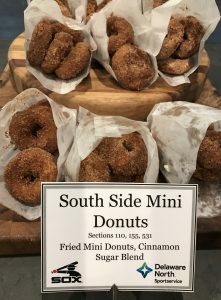 When you batter up for the Chicago White Sox home opener on Monday, April 3 against the Detroit Tigers, why not batter up with battered onion rings? Prepare to ooh and ah over those big ol’ “O” shaped rings. Naturally, they’ll be topping your 16-inch brisket mac & cheese grilled cheese sandwich with barbecue sauce. Smile and just say cheese. But let’s revisit that crowd pleaser. 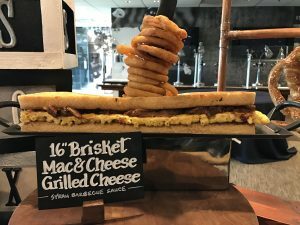 For $28, you can get a homerun-sized mac and cheese sandwich, about a third of a length of a 42-inch baseball bat. Add in the protein for $6 (which is the brisket) and you’ve got yourself a whopper of a meal at $34 for one heck of a rain delay or date to remember. 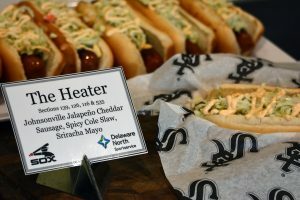 Sonia Respeto, Levy Restaurants executive chef at Guaranteed Rate Field, called the sandwich a “wow” item on a buffet display set up indoors for a March 29 media tour at Guaranteed Rate Field in Chicago (333 W. 35th St.). The one-hour morning media tour began in the Guaranteed Rate Club. The buffet that Wednesday in the club featured selections such as home-baked pretzels, a chicken margarita sandwich and a dessert, a Choco kebab that looked similar to a large slab of gyros sliced in sandwich shops. “Which is my favorite?” Respeto said, responding to the question by reporters. “Actually, the brisket mac & cheese grilled cheese,” she said with a smile. Officially called “The 16-inch Brisket Mac & Cheese Grilled Cheese,” the sandwich is one of the menu introductions for the 2017 season. 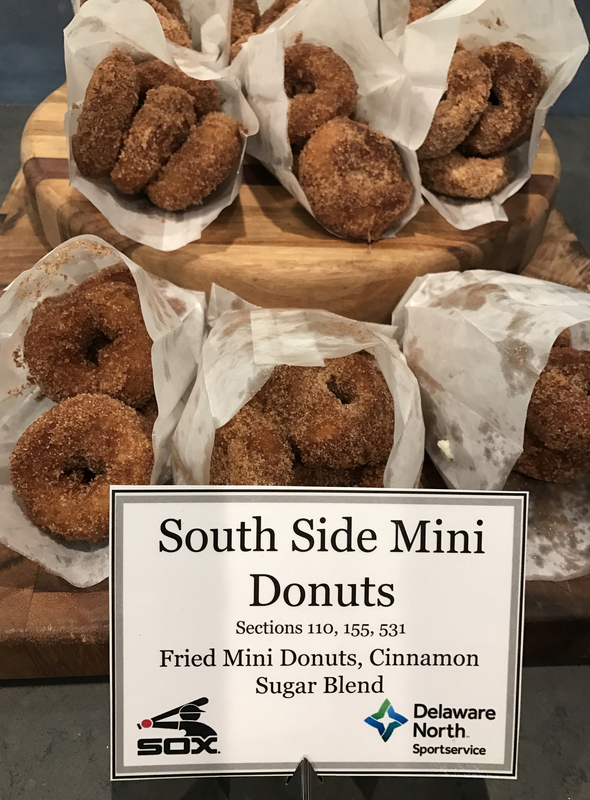 Fans can look forward to newbie concession offerings such as South Side Mini Donuts, served warm (Sections 110, 155 and 531). Sold in Section 157, “The Wok Off” features egg lo mein noodles, fresh vegetable blend, chicken breast and chili garlic sauce in traditional portable packaging. “The Wok Off” can also be ordered vegetarian, said Rebecca Spalding, Sportservice operations manager at Guaranteed Rate Field. “It’s a nice new concept taking from our neighbors in Chinatown,” Spalding said. Also new this year is Suite 134, an indoor oasis over repurposed former seating/storage space. 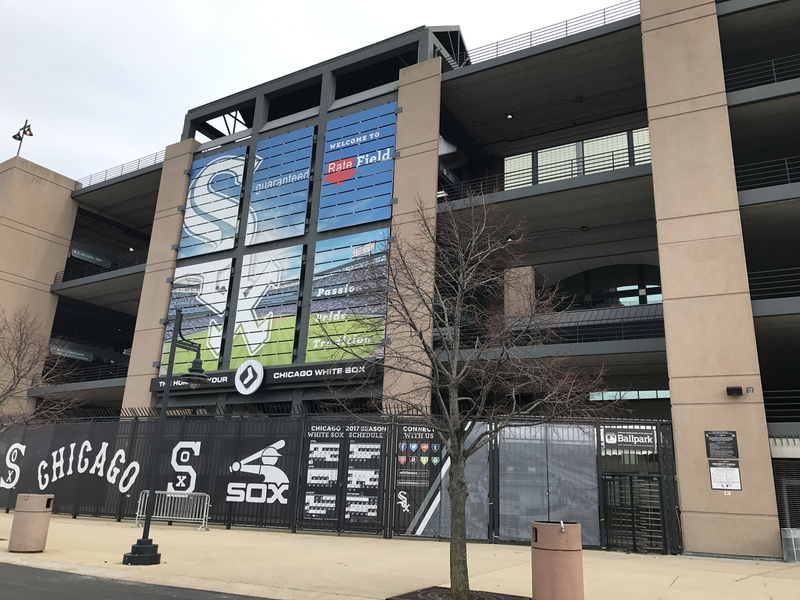 Suite 134 is rented for $4,000 to $6,000, depending on game, accommodating 25 people with a catering package and parking, said Jeff Bogacki, senior manager of group sales for Guaranteed Rate Field. The behind-home-plate location, “is a great view,” he said. “We’re just trying to improve the fan experience and give them another option here at the ballpark to enjoy with friends and family or business clients,’’ Bogacki said. The expanded concession menu includes Modelo beer, the newcomer official import of the Chicago White Sox. Typical computer keyboards don’t make it easy to make the “K” backward in “Kave.” But that’s what the logo says. 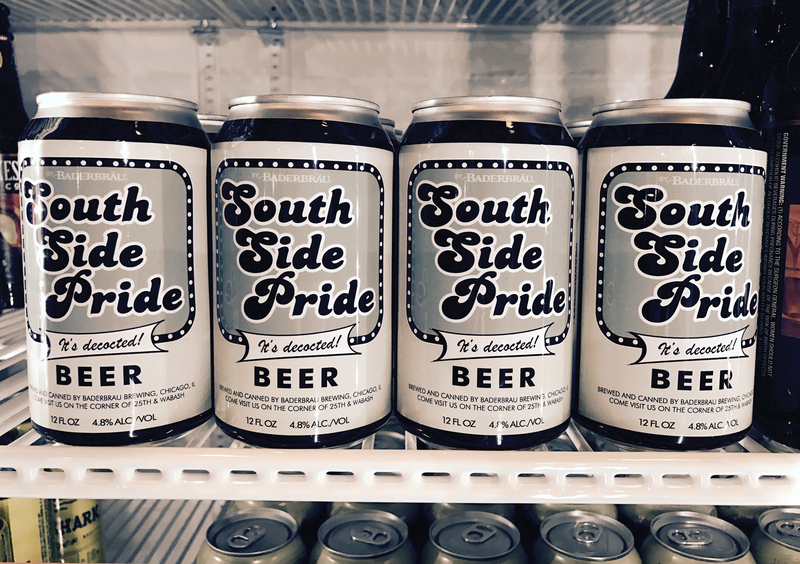 “I’m super excited,” said Joe Nigro, Sportservice general manager at Guaranteed Rate Field, who talked about the Craft Kave standing near long refrigerated shelves of craft beer. “The offerings we’re going to give our fans are really going to enhance their experience,” Nigro said. Burgers sold in the Craft Kave have many names and ingredient variations too. Expect to see the “‘Veeck As In Wreck’ Burger,” which has a double patty, American cheese and stacked onion rings. With your craft beer, you could try the “King 14” burger which has that double patty, but with Italian sausage, sweet peppers and mozzarella cheese. 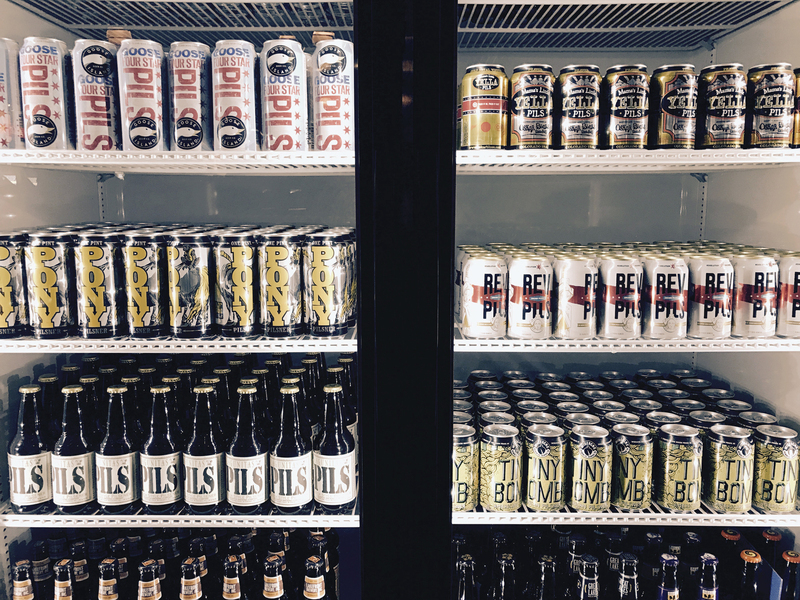 “To have a ballpark that’s so invested in craft beer and so invested in good food, it’s pretty amazing,” said Christopher Kolodziej, a culinary expert who assisted on Craft Kave food and craft beer pairings. 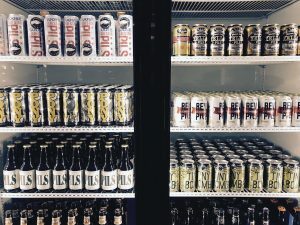 “It just kind of shows you how far craft beer and the food culture in the U.S. have come,” he said. 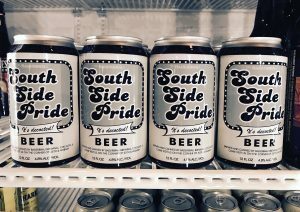 With 38 breweries and 75 flavors featured in the Craft Kave, the White Sox season afternoon home opener should guarantee to be the start of a flavorful season at Guaranteed Rate Field. For sure Nigro guarantees it. “I know they’ll (fans) be surprised when they see it on Monday,” Nigro said.